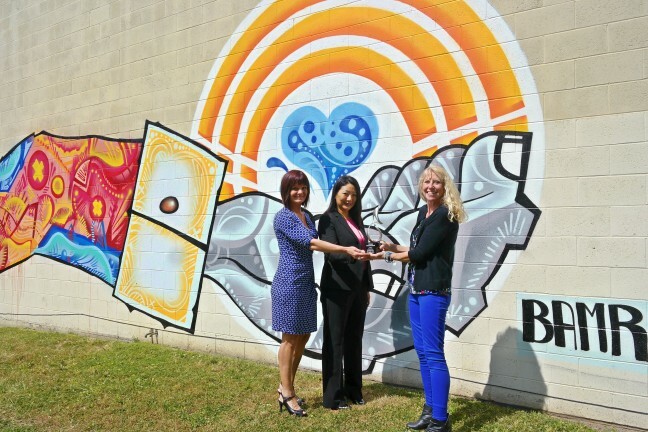 As United Way California Capital Region dedicated last week to thanking its volunteers, donors and partners, the nonprofit also unveiled a new public mural called “United Passion” that it commissioned from local artist BAMR. California Society of Health-System Pharmacists donated the space at 13th and H streets in Sacramento. The mural was unveiled as United Way gave out its most prestigious award, the Intel Cornerstone Award, to Enterprise Rent-A-Car for its dedication to the nonprofit community and United Way for more than 18 years. The Intel Cornerstone Award is given each year to a United Way corporate partner that not only has achieved top results in its United Way campaign, but also has prioritized volunteering and donating as part of the corporate culture. The award was originally presented to Intel for its unprecedented record of community giving and volunteerism, and Intel now presents the award each year to a United Way corporate partner deemed to deserve honor during United Way’s Week of Thanks.